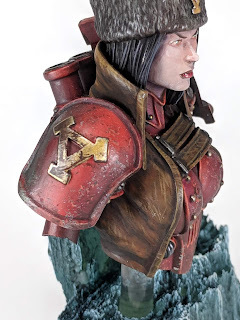 Ever since Privateer Press started doing busts I'd wanted to get my hands on one of them an give bust painting a shot. 2018 was the year of the bust and I was able to pick up Kommander Sorscha at Adepticon that year. I took her with me to St. Louis and painted her over the course of two days at a gaming convention down there, while recording video of her for Let's Paint. As I don't know much about the various factions in Warmachine, so I decided to play it mostly safe and paint Sorscha's armor in the standard red color scheme. I painted all the armor Rhinox Hide to begin with and then worked my way up on the highlights using Khorne Red, Evil Sunz Scarlet and Wild Rider Red. The shadows were dialed in using Green wash, which is something I love doing and really helps deepen the shadows. It's great showing this trick to folks who've never seen it too, it melts their brains as they see it work its magic. One issue I had while painting her was the skin tone. I was attempting to make her look pale and cold, without looking accidentally dead. She's also a female warrior, so I was going for a bit of a more battle hardened look and not a pretty princess. I failed a bit at that. On my busts, I like to do a the lighting as if they are light from 3/4s view. 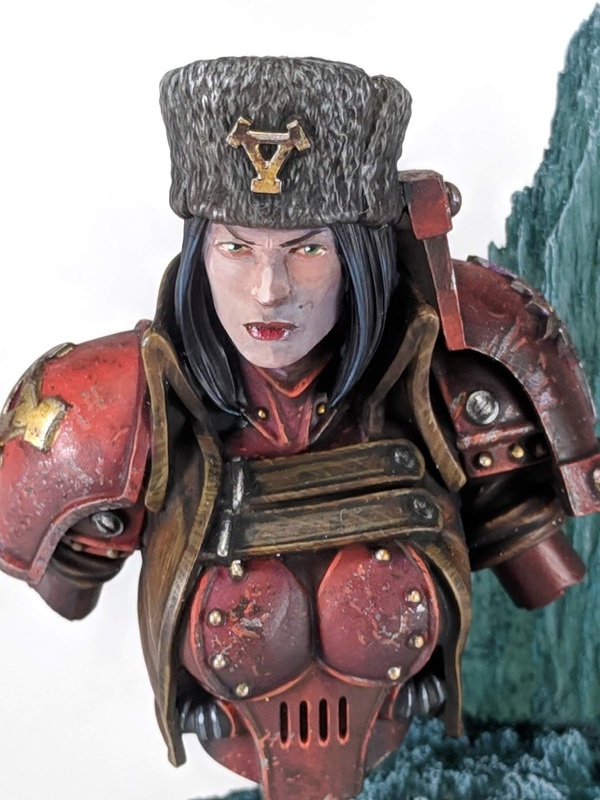 While the armor worked out nicely at this, the shadowed side of her face it looks like she has beard scruff. Her face wasn't a total disappointment though. I really like how her hair, eyes and lips turned out. They eyes were fun. While Dan and I were sitting at the convention talking about what color they should be, Dan decided to message our friend Alexa, who is Russian, what color her eyes are. 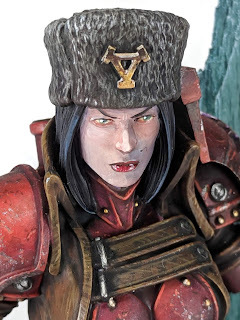 She then sent us a selfie, so I could paint Sorscha's eyes to match. 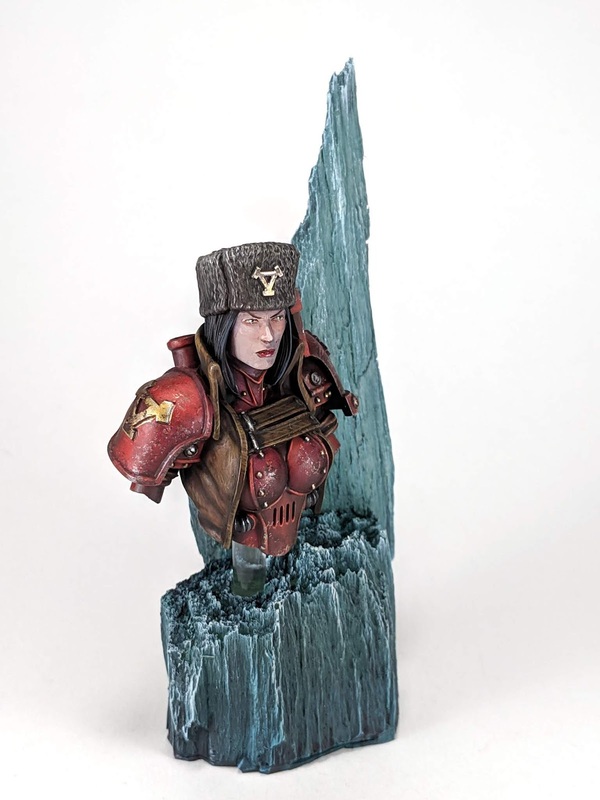 Quite possibly my favorite part of the piece is her plinth, which is a shard of ice made. This ice shard was made by casting a broken chunk of wood in a silicone mold. The mold was then filled with clear resin and painted with washes to give it some color. I'm really happy with how that turned out. 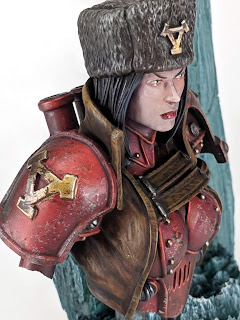 Another section that I'm really pleased with was her leather coat. 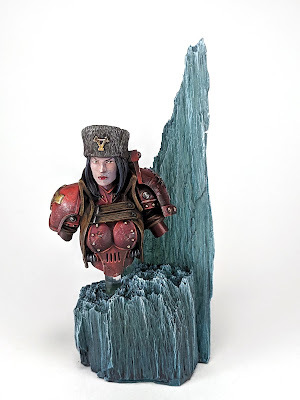 I absolutely love painting leather on models, and these busts crank that up to eleven. 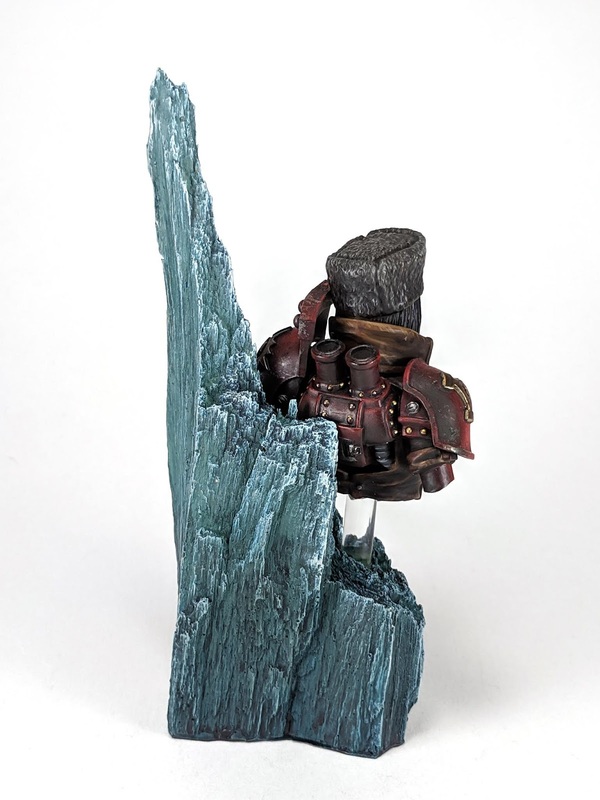 The large surfaces let me play with coloring and weathering a lot more. The coloring especially, thanks to the use of green and purple washes to vary up the surface color. Overall, I'm really happy with how she turned out. 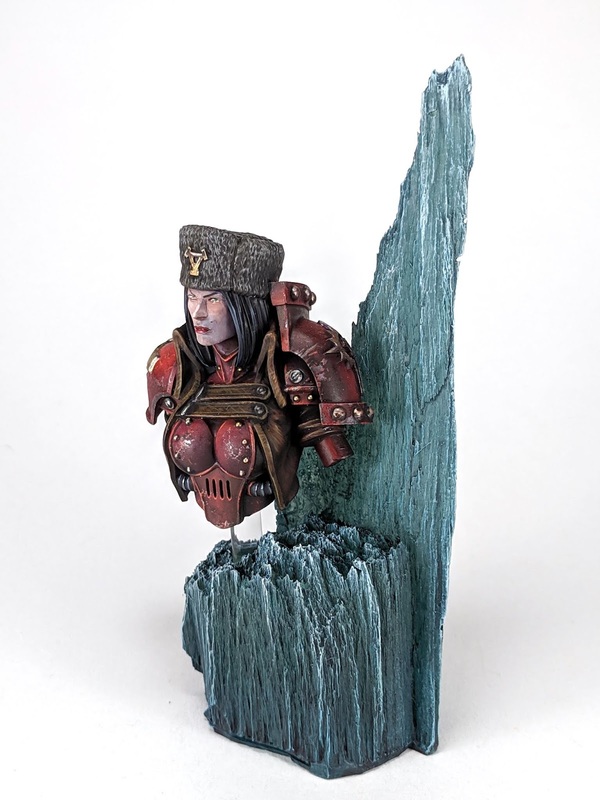 She was only my 3rd bust ever and I learned quite a bit from her too. I took her to GenCon and was able to squeeze her in as a last minute entry for the P3 Grandmaster painting competition, where she scored a bronze medal! That was a pretty good feeling, for sure.